Photographs in which a cap badge is shown are very useful. These officers belong to the King’s Own Royal Lancaster Regiment whose cap badge is a lion surmounting the words “King’s Own”. A number of regiments had very similar cap badges so its best to use a magnifying glass or scan the image to make sure you have the correct identification. If you are researching a lot of soldiers or are just interested in the First World War I would highly recommend British Army Cap Badges of the First World War by Chris Foster and Peter Doyle. 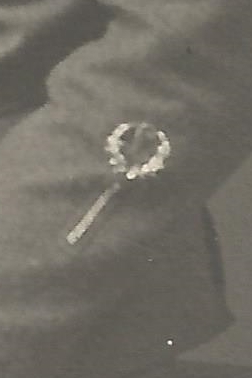 This photograph shows a Territorial Force Imperial Service Badge which was worn over a soldier’s right chest. If your soldier was wearing this badge then he was a member of the Territorial Force, the forerunner of the Territorial Army. I have written an article about the badge here: Imperial Service Badge. 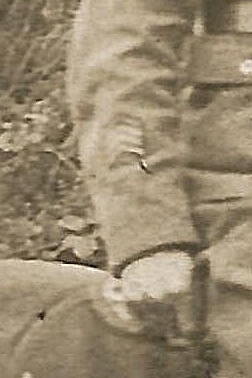 Look carefully for wound stripes, which appear on the lower left jacket sleeve of a soldier. These can be hard to distinguish so it’s best to scan a photograph to be sure. 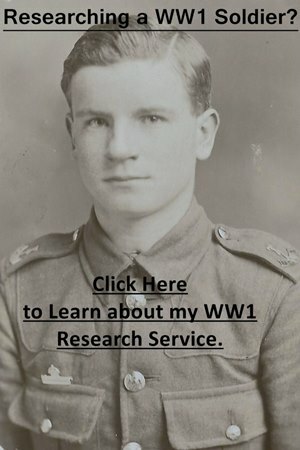 If you have a photograph of a soldier with a wound stripe it will date from July 1916. A soldier with a wound stripe should also appear in a Casualty List. I have written an article about wound stripes here: Wound Stripes. 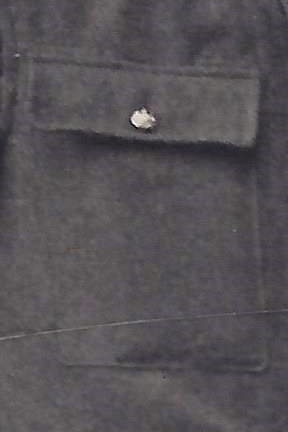 On a soldier’s sleeve (above the elbow) there could be a number of chevrons depending on his rank. As a general rule, though there are exceptions, for the infantry the following will usually apply: 1 for a Lance Corporal, 2 for a Corporal or 3 for a Sergeant. The sleeve on the left belonged to a Bombardier (Corporal) in the Royal Artillery. The Bombardier also wears a Gun Layer appointment badge which was an L in a wreath. Have a look at the pockets of a soldier’s jacket. If there are no pleats, then they are wearing a simplified pattern service dress, introduced in late 1914 to meet production demand. While this jacket was in use throughout the war, you are more likely to see this jacket on a soldier who volunteered during the first year of the war. A Silver War Badge should never be worn on a military uniform but you will see it worn on civilian dress. If a man or woman is wearing a Siver War Badge then it means that they were honourably discharged from the armed forces during the First World War. 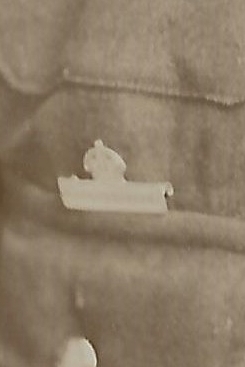 A photograph in which a Silver War Badge appears dates from September 1916. I have written a separate article about the badges here: The Silver War Badge. Shoulder titles may also be visible in the photograph and this is where I would really recommend scanning the image as they are often very difficult to see. It is best to scan the image in a high resolution and zoom in on a computer. 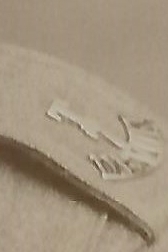 The distinctive T marks this soldier out as a member of the Territorial Force. Though it is hard to read, he was serving in the 7th Battalion Devonshire Regiment. 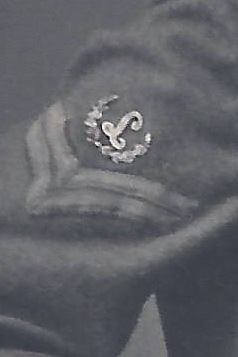 Look at a soldier’s lower right sleeve as he may be wearing Overseas Service Chevrons. Learn more about them here: Overseas Service Chevrons. 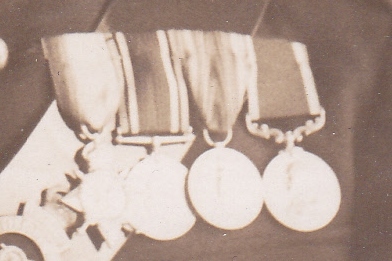 These medals belong to my great-great uncle. He was wearing a 1914-15 Star, British War Medal, Victory Medal and the Army Long Service Good Conduct Medal. Learn more about medals with my guide: First World War Campaign Medals.